We always love going out and having a great dinner in Vegas but we love it even more when it’s for a good cause. Las Vegas Restaurant Week will celebrate its 10th anniversary June 6 – 17 and we can’t wait. Participating restaurants will create prix-fixe menus offered at price points ranging from $20 to $80, with a fixed portion of the proceeds benefiting Three Square and the fight against hunger in Southern Nevada. The $80 option is new this year and it’s a great opportunity to try a meal at a high-end restaurant that you might not normally go to. Some of the participating restaurants include: Alizé, Blue Ribbon, China Poblano, Culinary Dropout, Del Frisco’s Steakhouse, Fogo de Chao, Hakkasan, Holstein’s Shakes and Buns, Honey Salt, Itsy Bitsy: Ramen and Whisky, Gilley’s Bar-B-Que, MOzen Bistro, Searsucker, Sushi Roku and Wolfgang Puck Bar & Grill. So how does it work? Just check out www.helpoutdineoutlv.org to find a list of participating restaurants and their menus. Choose your restaurant, go have an amazing meal and some of the proceeds will benefit Southern Nevada’s only food bank. Three Square currently distributes more than 38 million pounds of food and grocery product – the equivalent of more than 31 million meals – per year to more than 1,300 community partners including nonprofit and faith-based organizations, schools and feeding sites throughout Southern Nevada. In its first 10 years, Las Vegas Restaurant Week has raised more than $1 million for Three Square. 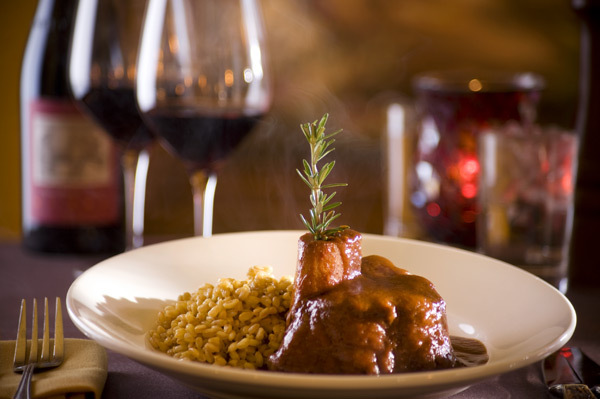 Osso Buco at Ferraro’s, photo courtesy of Ferraro’s. Menu: The menu includes a choice of two appetizers such as agnolotti — a ravioli filled with spinach, mascarpone, ricotta and mortadella; trofie Italia — a Ligurian-style house-made pasta with basil pesto, cherry tomatoes and ricotta cheese; and gnocchi pomodoro — house-made potato dumplings, Campari tomato sauce, basil and extra virgin olive oil. There’s also a choice of salad, an entrée such as pollo alla Parmigian; vitello piccata and osso buco; and a dessert sampler. Photo by Claire Thomas, courtesy of Sushi Roku. 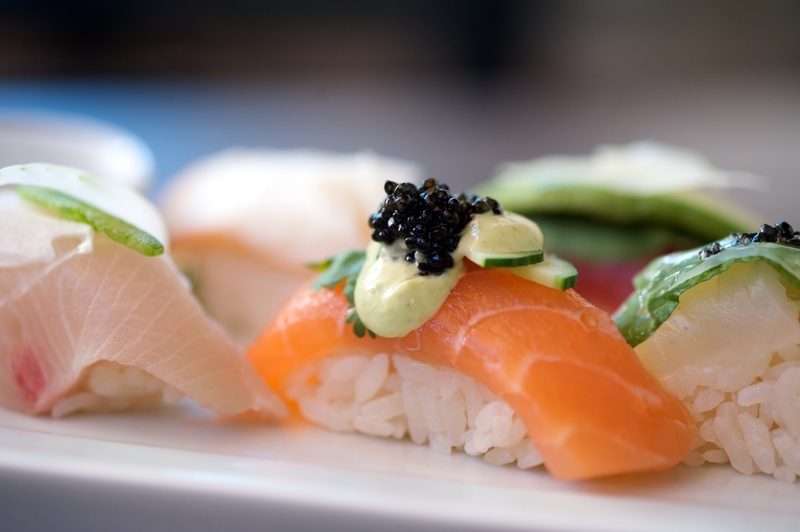 Menu: Sushi Roku will offer a three-course prix-fixe menu for lunch. First course is seaweed salad; second course is an assorted sushi selection and third course is a choice of three mochi ice creams. Menu: The lunch menu includes a three-course meal featuring a choice of roasted red pepper bisque or kale salad to start followed by a Cuban sandwich or the BLT with peppercorn maple glazed pork belly, watercress, heirloom tomatoes and truffle honey mayo on sourdough bread. Dessert is a sorbet trio with pink champagne, raspberry and lemon or assorted mini cheesecake bites. Menu: The first course features insalata Romana with sweet garlic dressing, fennel, and Parmigiano frico or fried calamari with marinara and pickled hot peppers. 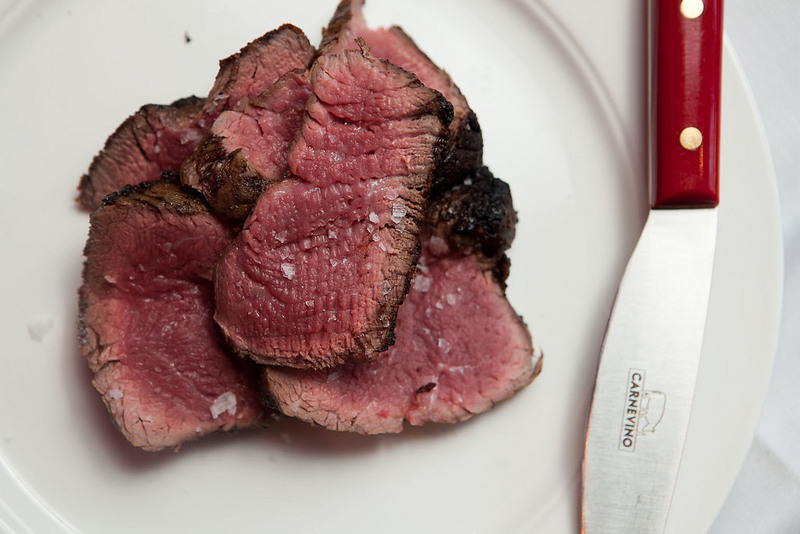 Entrees include a choice of filet mignon, New York strip, striped bass or garganelli with porcini trifolati. Dessert is a choice of bonet with apricots and cherries; zuppa Inglese with fresh berries or seasonal gelati and sorbetti selections. Menu: Morels is offering a three-course breakfast option starting with a fresh seasonal fruit plate. The second course is a choice of American breakfast, classic Benedict, a veggie omelet or buttermilk pancakes. The third course is a choice of strawberry crepe or French pressed coffee. 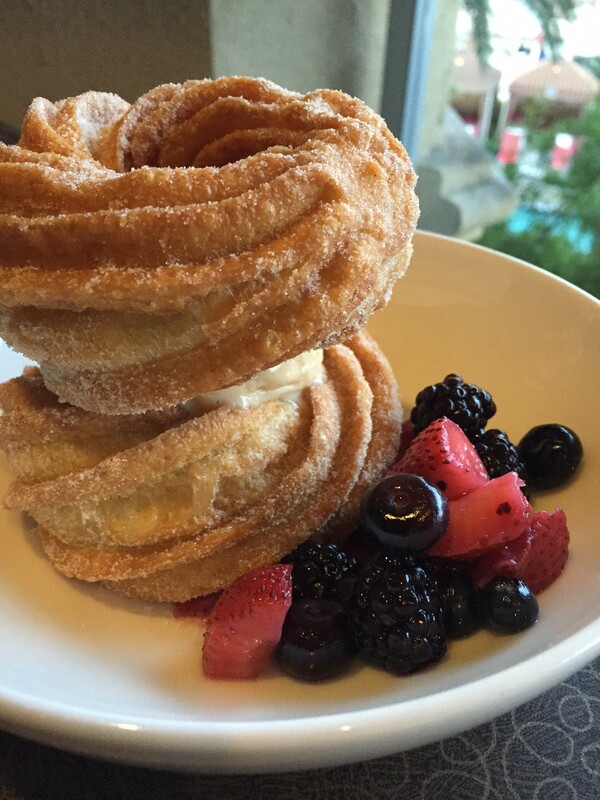 The churro ice cream sandwich at Border Grill, photo by Kristine McKenzie. Menu: The three-course dinner includes a choice of puffed grain salad or langostine for a first course followed by a second course of pork jowls. Dessert is a churro ice cream sandwich with salted caramel ice cream and tequila berries. 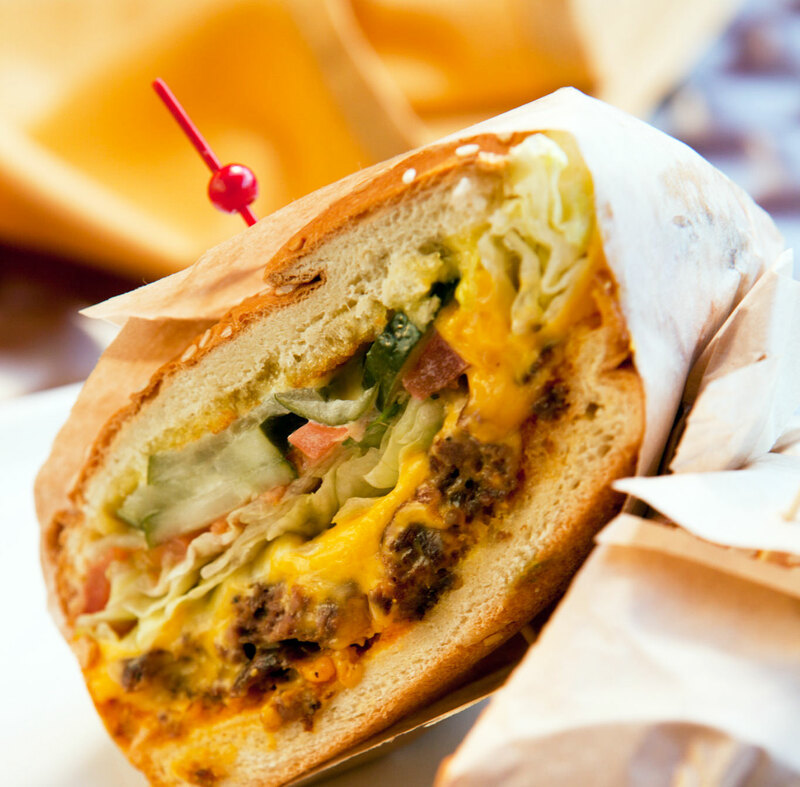 The Drive-Thru burger, photo courtesy of B&B Burger & Beer. Menu: The three-course dinner menu includes a choice of chicken wings or chop salad to start. Second course is a choice of an all-beef hot dog, eggplant Parmagiano or the Drive-Thru burger. Dessert is a caramel swirl shake. Menu: The three-course dinner menu starts with a choice of dip. Second course is a choice of harira soup or chopped salad. The third course is a choice of chicken tagine, grilled octopus, garlic shrimp or seasonal mushroom flatbread.